The Sutjeska National Park is a national park in Bosnia and Herzegovina. It is in the Republika Srpska. 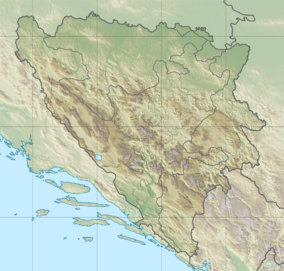 Established in 1962, it is Bosnia and Herzegovina's oldest national park. The park includes the highest mountain in Bosnia and Herzegovina, Maglić. The park covers an area of about 17,500 hectares (43,000 acres). Perućica Forest Reserve is located within the park. It is 6 kilometres (3.7 mi) long, 1–3 kilometres (0.62–1.86 mi) wide, and has an area of 1,400 hectares (3,500 acres). It is a UNESCO recognized site. The forest has many trees that are 300 years old. It is a primeval forest. This page was last changed on 31 December 2016, at 19:00.